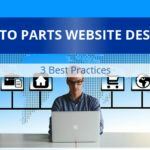 Shopify, BigCommerce, and 3dcart are all in that last general category, and recent changes have made these platforms much more viable for auto parts and accessories etailers. In this article, we’re going to look at recent developments and show how these general ecommerce sites are viable for auto parts ecommerce. Year-make-model lookup is an important capability in auto parts ecommerce. Not only because consumers like this feature, but also because it’s difficult to make a larger auto parts ecommerce site usable without it. 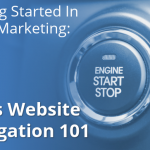 If, for example, you want to sell 5,000+ SKUs on your auto parts website that doesn’t have year-make-model lookup, you need to use categories to organize your parts. Granted, child categories can be divided into more children, but there’s a point of diminishing returns. Not to mention, consumers don’t enjoy the process of digging through categories to find the parts they need. For years, the key difference between general ecommerce sites (like BigCommerce or 3dcart) and auto parts specific ecommerce sites (like Web Shop Manager, Square.parts, Auto Parts Shopping Cart) was year-make-model lookup capability. General ecommerce platforms didn’t offer this functionality, while auto parts specific platforms had year-make-model built in. Recently, add-ons have become available that offer year-make-model lookup on these general ecommerce platforms. At Spork, we have a lot of experience with BigCommerce. While it’s not our favorite ecommerce platform for aftermarket auto parts and/or accessories, it’s certainly a contender. If we had a complaint about BigCommerce, it would that there’s no built-in backup feature. But that’s about it. There are two BigCommerce add-ons (PartFinder and Year Make Model Search) that offer year-make-model lookups. With Year Make Model Search, you install a BigCommerce app, follow the configuration process, and then upload your fitment data via CSV. Looking over the documentation here, this app seems like it’s useful. We haven’t tested it, but it’s in use on actual live sites, and that’s typically a good sign. With PartFinder, the integration seems a little more polished. Additionally, this app has more documentation and seems a bit more user friendly. Both apps have a recurring monthly fee – either $30/month (Year Make Model Search) or $50/month (PartFinder). This is in addition to the BigCommerce plan fee, which is going to be $80 or $250 a month. Shopify is an increasingly excellent ecommerce platform, even if it is often marketed as a “mom and pop” ecommerce tool. At Spork, we have had mixed experience with Shopify. On one hand, Shopify sites tend to look great and convert reasonably well. On the other, extending Shopify with various apps is all but required. A $29/month store might need $50/month of extras to offer capabilities we expect to find on an ecommerce site. There are at least three solid year-make-model search add-ons available for Shopify, and just like add-ons for BigCommerce, they cost no more than $50/month in addition to the Shopify plan fee. 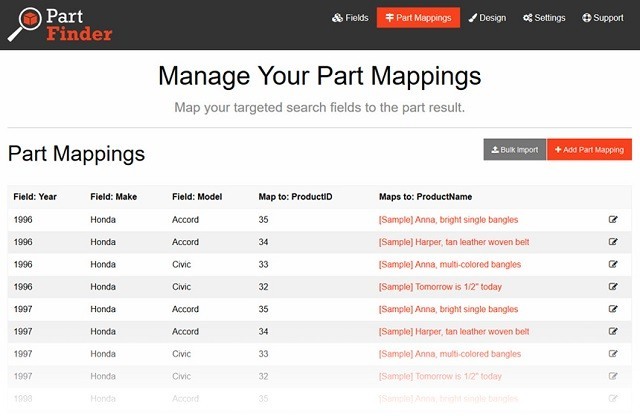 Automotive Part Search from GoVedia seems like the most polished option available for Shopify stores. While it’s the most costly add-on at $50/month, it offers a “My Garage” feature, it’s easy to manually add individual fitments (most add-ons only want you to add fitments via upload), and the integration is simple. Additionally, the GoVedia add-on has fitment verification built-in, which means that people who are on your site can view and product and see a “This product fits your vehicle” message in the template. This is something that can boost conversion rates, so it’s a feature we like. EasySearch – Make-Model-Year Search from NexusMedia is another option. While it’s not specifically marketed as an app for auto parts and accessories retailers, it’s backed by an established company and well reviewed. It’s also affordable – just $15/month. Finally, there’s Year Make Model Advanced Search from Capacity Web Solutions. It’s the least expensive option at $10/month, and it’s also well reviewed. This add-on isn’t quite as polished (in terms of appearance) as the other options here, but it will accommodate multiple levels of refinement. Incidentally, Capacity also makes one of the apps we profiled above for BigCommerce. At Spork, we have very limited experience with 3dcart. Still, the platform is increasingly popular and there’s a lot to like. If we’re talking about selling aftermarket auto parts or accessories online, our recommendation is go and check out the hosted platforms specifically designed for our industry. (e.g., Web Shop Manager, Parts Square, etc. See our list here.) However, if these platforms aren’t feasible because of up-front costs, then we’d recommend starting at the top of our list here with BigCommerce and working your way down. 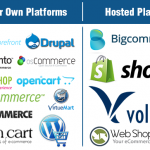 Finally, it’s important to note that we recommend hosted ecommerce over self-hosted systems in nearly every situation. While there are some good reasons to use a self-hosted platform like Magento or WooCommerce, they’re often inferior to hosted systems in terms of features, security, stability, performance, and cost. As always, if you’re an auto parts retailer looking for some input on an ecommerce platform, please don’t hesitate to contact us. We’re happy to talk to you, learn about your specific needs, and offer up a couple of recommendations. 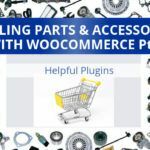 Auto Parts Websites – Build Your Own or Pay For A Hosted System?